If the church is responsible for evangelism, then it seems that some of its meetings will be intentionally evangelistic. Is there evidence in the New Testament? There is not any direct command to invite or direct prohibition against an invitation. We don’t see the command to invite the unsaved, nor do we see a prohibition against inviting the nonbeliever. We do not see the apostles or other leaders specifically inviting people to the assembly. Is it possible that the early Christians invited people to the local assembly? Sure. Is it plausible that they invited people? Sure. There are plenty of gatherings in the New Testament that suggest unsaved people are in their midst. People came to faith in those gatherings, so they must have arrived as an non-believer. No matter where we stand on inviting the unsaved, we are having to make the argument from plausible assumptions. some other form of curiosity brought them to that church. In this passage, Paul doesn’t preach against inviting unbelievers to church. He acknowledges the reality of their presence, no matter by what means or reason they come. But some of them became obstinate; they refused to believe and publicly maligned the Way. So Paul left them. He took the disciples with him and had discussions daily in the lecture hall of Tyrannus. This suggests some form of evangelistic activity. It is plausible and possible that some of that expansion had personal invitations given to non-believers to come and hear Paul. It is possible that non-believers heard the gospel from Paul, believed, and then carried that gospel forward to new places. It is possible that non-believers gathered in Paul’s teaching for several weeks until they became convinced of the truth of the Gospel. This form of evangelism cannot be ruled out. The text doesn’t give an indication of exclusion or inclusion of non-believers listening to Paul in the lecture hall. It appears to me that there no good cases to be made for avoid the presentation of God’s Word to anyone until they prove themselves to unreachable. Even then there might be one small seed planted in their hearts. I believe that the soil of a soul of a true unbeliever should be prepared by Christians seeking to help them find the Savior. We do this best by the example we set outside our Church walls. Many Christians seem to believe that God is their “Private Property”. I would contend that “All” are His through ” His Grace” and none of us are worthy by our own doing. We are here to expound the glories of our God not our goodness. I like the concept that we should demonstrate our likeness to our Loving God, using words when necessary! If I were not His child, I would look upon todays churches with a great deal of skepticism, maybe even call us hypocritical ! Our tendency seems to be, to soft pedal the Word to win over converts. I pray that we wake up before it’s too late, lukewarm isn’t good enough..
Look, every church in America has people who are members, and yet they are functional unbelievers…. So every service is… Or should be… Seeking the lost in our midst. Thanks for making great points! What I want to dig into to see is evidence from scripture that supports either an open invitation to non-believers to attend our gatherings, or a specific prohibition to keep them out. Since I don’t think there is direct evidence, we have to make inferences from the text. In future posts, I’m looking at the various assemblies to make note of the possible presence or exclusion of non-believers. My point is not to pick a fight, but for me to know the reasons why I choose to invite the unsaved to church with me. Jesus said to the demoniac not to follow him but rather go and tell all your friends and family what God has done for you. That sounds exactly like what the woman at the well did. She went and proclaimed the glory of her encounter with the messiah. This also sounds like what is happening in Acts 8:4, “Now those who were scattered went about preaching the word.” Also, how beautiful on the mountains are the “feet” of those who preach the gospel. All of this is to say that the force of the New Testament is “going” to evangelize. However I think that going can look like, “Hey you should come to church with me this Sunday, I think you would really like it.” Or whatever. The point is we are so excited about meeting the living God that we want others to meet him too. Press on brothers! With the caveat that inviting people to church should not be the fullness of our proclaiming. If it comes in the context of telling people about the Jesus you have met, then I think it can be healthy. I am open to learning however. Given that the early church was an organization in development, not a whole lot can be said about the practice of inviting the unchurched to come to church. I’m continuing my reading of Acts, and will be dealing with some of the “believer only” evidence that is being shared with me. More will be forthcoming. We were admonished to “go into all the world and preach the Gospel.” We do so by sharing our experiences of what God has done for us. When we invite unbelievers to church, we are inviting them to experience the fellowship that the Holy Spirit brings. I believe it is a beautiful and we should continue to invite unbelievers to our church. Thanks Mernell for chiming in. At some point, “the church” shifted from a description of who the Christians were to a gathering of the Christians for worship and prayer. As time went on, the Sunday services developed all sorts of flavors, rituals, etc. I actually just finished posting something along these lines. The inference, as I see it, lends both ways but, unlike what you might be stating, I tend to lean towards a ‘no’ for an answer. The main reason for believers to assemble themselves is ‘not’ to preach the gospel and, if a local church is doing what it is supposed to do, the messages being given won’t be centered around an evangelistic effort. According to how I see the churches being set up and the reason stated by Paul, an unsaved person’s visit won’t deal with the first and fundamental problem of the unsaved person because the assembling of ourselves is useful as a ‘Christian Boot Camp’. It is where we prepare ourselves to do the evangelistic effort and not to specifically evangelize within the assembly itself. You lead to Christ and then you invite them in so that they may grow and be prepared to do the same to the next person. Main passage that I hold to is Ephesians 4:11-15 as the reason for the leaders of a church which also describes what their job is in relation to the assembly of believers under their care which deals very little with the evangelistic effort. Unsaved persons should be welcomed to visit the local assembly but their continued fellowship with them should be contingent upon their commitment to Christ and the surrender of their lives to Him. Otherwise, the eventual result should be expulsion so that the local assembly is not maligned (sort of the same reason why you would take a fornicator out of your midst (I Corinthians 5)). What fellowship has light with darkness? From all that God commanded Israel to all that we read in the NT it is clear that we go out into the world with the gospel and then those who are saved are added to the church. Period. We must stop trying to add people to the church when they are not saved. yes there is the matter of the wheat & tares but our koinonia is based on BODY OF CHRIST only. When we get saved we are conveyed from the kingdom of darkness into the kingdom of the son of His love. Col 1:13. There is no problem with having a gospel preaching meeting per se but it’s not a church meeting. Church meeting are for the edification of the body (ONLY) unbelievers can not edify the body can they? The point you raise about tongues are for the unbelievers has to do with Israel see 1Cor 14:21 in context. That is not what he is saying. You have not understood the text. Please pray, read again, pray again. The meeting of God’s people is just that, the meeting of God’s people. Sry, I take it back. ignore me. Mr. Martin Smith, what do you make of the text when it says “But if an unbeliever or an inquirer comes in while everyone is prophesying, they are convicted of sin and are brought under judgment by all, as the secrets of their hearts are laid bare. So they will fall down and worship God, exclaiming, “God is really among you!”” as a basis for the argument you deny? I deleted a comment that attacked and criticize people in the guise of asking questions. Remember, keep the discussion on the issue, not the persons. 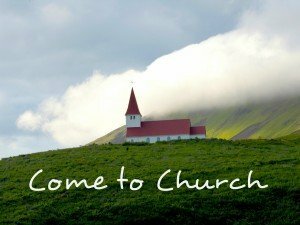 The question here is: should non-believers be invited into the local church? When I look at the NT evidence, one has to draw conclusions based on observations on the book of acts, as well as a scripturally informed understanding of the nature and purpose of the visible church assembly. In related posts on this site, I look at the various assemblies to make note of the possible presence or exclusion of non-believers. Since the bible is silent about the topic of inviting unbelievers to the gathering we go ahead and invite them. Then should we not also conclude that communion should be handled the same way? The bible says nothing about whether unbelievers should participate in it. Therefore they should be allowed to take it, right? Tim, you ask a great question. .. . to answer it will take more than a comment here. A quick google search reveals lots of discussions about that very question, much like this post invites lots of conversation. It really comes down to how does one interpret 1 Corinthians 11:17-32 based on some your surrounding theology. 1. “You proclaim the Lord’s death until he comes.” The use of proclaim is always used as a word conveying preaching or proclaiming the Gospel to non-Christians. This suggests at least unbelievers are present, and that Communion is a visible symbol of the message of the gospel. But whether they can share in it or not, is not answered here. 2. Each person is responsible to examine themselves, and those “who eat and drink without discerning the body of Christ eat and drink judgment on themselves.” (1 Cor. 11:29). This is where the disagreement comes in practice and in theology. . .
I’m not going to settle a long church history debate on this topic. . .